Mergulhe na cultura chinesa e aprenda a fazer deliciosos bolinhos em Xangai. 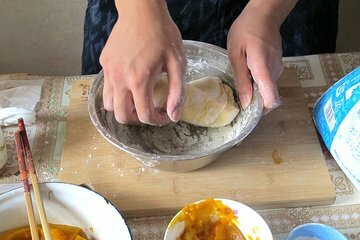 Este workshop de 3 horas ensina aos clientes como fazer bolinhos jiaozi tradicionais do início ao fim. Faça versões vegan e vegetarianas saudáveis ​​com seus instrutores e aprenda as técnicas necessárias para recriar as receitas em casa com qualquer recheio que você desejar. Em seguida, sente-se aos frutos do seu trabalho e desfrute de uma refeição deliciosa. Spending an evening with Anna at her home and learning how to make dumplings is one of my most memorable Shanghai experiences. Anna was so accommodating, she was happy to start her evening cooking class an hour earlier for me so I could be at the airport in time to catch a plane later that evening. Anna speaks excellent English and I enjoyed the evening in her company, sitting at her kitchen table as we chatted about our love for food and cooking. I learned how to make two fabulous dumpling fillings pork and celery, egg and chives and we then made and rolled out from scratch, color of the rainbow dumpling dough. Once steamed, we sat down together Anna knocked up an amazing salad of cucumber, tofu, mung bean and sesame dressing and we enjoyed dinner together. This was truly a special evening for me and if you are a foodie and would like to do something a little different while you are in Shanghai, I highly highly recommend this experience.